Service members with the Japan Air Self-Defense Force (JASDF) 2nd Air Defense Missile Group, set up the MIM-104 Patriot missile system during Patriot Advanced Capability-3 (PAC-3) deployment training at Marine Corps Air Station Iwakuni, Japan, Aug. 29, 2017. The distinction between “active” and “passive” deterrence has proven useful in the literature on international cyber aggression. “Passive deterrence” is the equivalent of the military strategy of “deterrence by denial.” An aggressor is deterred by the certainty that they will not achieve their objectives because of the defensive capabilities of their opponent. 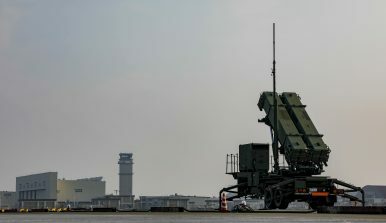 Japan seeks such a capability against North Korean nuclear and ballistic missile attack by installing (and now upgrading) ballistic missile defense (BMD) and it also benefits from “deterrence by denial” provided by the United States. “Active deterrence,” on the other hand, is deterrence based on retaliation. It is akin to “deterrence by punishment.” An aggressor is deterred by the certainty of a crushing military response from the target state. For this kind of deterrence, Japan is almost wholly reliant on the United States. As a military strategy, active deterrence could be deployed against North Korea’s ballistic missile tests under specific conditions. It requires both the will and capability to shoot down missiles test-fired towards and across the territory of other states. The United States has already adopted a posture of active deterrence by threatening to shoot down ballistic missiles fired into the sea close to Guam. Active deterrence used in this way has several advantages. First, it imposes a cost on North Korean aggression but falls well short of preventive war. Similarly, although expanding the use of BMD, it is far less offensive than posing a “kill-chain” threat to pre-empt North Korean missile attacks (or tests) before they occur, which has been both advocated for the United States and adopted as a broader strategy by South Korea to defend itself against North Korean attack. Japan is also considering the option of cruise missiles to pre-empt a North Korean nuclear attack. Second, active deterrence reinforces passive deterrence and, importantly, avoids the intolerable risks, particularly to South Korea and Japan, of deploying a preventive war strategy. At the same time, it keeps military options open, reinforces a “strength in deterrence posture,” exerts a powerful demonstration effect and changes the rule of the game. There are signs, for example, that the American threat to shoot down missiles headed for Guam was a factor in the redirection of the North’s latest missiles over northeastern Japan. Kim Jong-un retreated from this option when U.S. Secretary of Defense Jim Mattis warned that the United States would “seek to shoot down any incoming missiles approaching Guam.” Japan could promise the same response to North Korean missiles test-fired towards its land, sea and airspace. Last but not least, active deterrence in this form would be an inherently defensive strategy for Japan, limit the domestic propaganda value of missile testing for the Kim regime, change the international security dynamic in dealing with North Korea and break the repetitive cycle of North Korea’s missile tests followed by the unproductive round of condemnations and sanctions from the United States, its allies and the UN Security Council. Aurelia George Mulgan is professor of Japanese Politics, University of New South Wales, Australian Defence Force Academy, Canberra, Australia.